Home / It’s Game Time! Bid for Free on Limited Special Gameplay Auctions this Month. Update: There will now be a 10 bid limit on each of these auctions. You’ll still get to bid for free, but you cannot place more than 10 bids per Free Gameplay Auction. Have you grown tired of bidding in the same old auctions? Now’s your chance to try something new and fresh, and it’s all at no cost to you! Throughout the next few weeks (August 9 – August 31, 2013), QuiBids will be hosting special Gameplay auctions that are completely free to participate in. What does this mean? Well, if you remember our April Fools auctions, it’s kinda the same concept. Bids placed in the free-to-bid Gameplay auctions do not deduct anything from your account, and you don’t have to pay the final auction price, which is why they’re called “free auctions.” The only difference is that you will be limited to 10 bids in each auction, so make ’em count! We’ll also increase the number of higher-value multipliers offered in these free Gameplay auctions as the month progresses. So when the promo starts (August 9th), you may see a few free Gameplay auctions for a 1X Gameplay. By about mid-August you should start noticing more 2X special Gameplay auctions in the mix. And around the end of August you’ll start seeing 5X Gameplays, which up until this point have never been seen before on QuiBids! We’re making QuiBids history, people! Click here to see if there are any Free Gameplay auctions available right now. The Free Gameplay auctions will be added throughout the month. So if none are available, just check back later! What makes these free Gameplay auctions different from normal auctions? 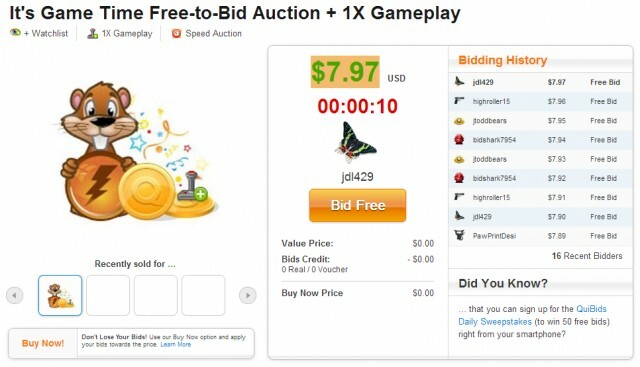 There are numerous differences that set these special Gameplay auctions apart from other auctions on QuiBids. One we think you’ll be particularly happy about is that it won’t cost you any bids to participate! So if you decide to try one of these auctions, don’t worry about stocking up on bids beforehand – you won’t need ‘em! Keep in mind that you must have purchased the starter bid package to be eligible to bid in these auctions. These auctions are strictly for Gameplays only. They are not hybrid auctions, nor are they You-Choose-It auctions. So if you win one of these, your account will be credited with a Gameplay which can be redeemed to play any of our games for Free Bids! What else should I know about the free Gameplay auctions this month? Since these auctions are free-to-bid, we can safely assume that they will all have quite a bit more competition than your normal QuiBids auctions. If you were lucky enough to participate in our April Fools auctions earlier this year, then you remember how competitive these free auctions can be. Just look at the rate of bids placed in the 6 seconds Vine clip of one of the April Fools auctions below. These auctions had an alarming amount of competition. However, we expect the Free Gameplay auctions to have slightly less competition because users will be limited to 10 bids in each free Gameplay auction. 1. You can only win one free Gameplay auction per 28 day period. Once you win your first free Gameplay auction, you will no longer be able to participate in another one for 28 days – which is basically the extent of this promotion. This is to prevent a similar situation that happened during April Fools when one user won a majority of the free auctions. We want to give everyone an opportunity to win! You can bet that these special Gameplay auctions will have a ton of competition. If you really want to win one of them be prepared for longer periods of bidding with more users going after the same prize. But hey! Since it’s free you might as well give it a shot. Just remember, you’ll have only 10 bids to use in each of these auctions, so spend them wisely! Keep in mind that the Gameplay multipliers (1X, 2X, 5X) will increase as the month progresses. So it may be a good strategy to wait until later in the month to go for one with a bigger multiplier. However, many other bidders could potentially have this same strategy so we expect the competition in the 2X and 5X free Gameplay auctions to be quite a bit more fierce than the 1X auctions. Definitely consider this when crafting your bidding strategy this month. Normally, we give away 50 Free Bids on Twitter every Monday – Friday by asking users to Retweet or answer a question to enter. But since It’s Game Time this month, we’ll be giving away 1X Gameplays instead of Free Bids using the hashtag #QGameTime. This does not apply to the Daily Sweepstakes on Facebook. Make sure you’re following us on Twitter so you don’t miss out on these additional opportunities for Gameplays this month. How do you think the competition will be on these free Gameplay auctions? Tell us your thoughts in the comments below. *Free Gameplay auctions are available to US, CA, AU, and UK bidders only. US auctions will start on August 9th. CA, AU, and UK auctions will start on August 12. Blog: What are QuiBids Games?